Corticosteroids are used to reduce harmful inflammation but can lead to diabetes - often referred to as steroid diabetes. People on steroids who are already at a higher risk of type 2 diabetes or those who need to take steroids for longer periods of time are the most susceptible to developing steroid induced diabetes. What is the role of steroids? To achieve their purpose, corticosteroids mimic the action of cortisol, a hormone produced by the kidneys and responsible for brining on our body’s classic stress response of higher blood pressure and increased blood glucose levels. Corticosteroids increase insulin resistance thus allowing blood glucose levels to rise and remain higher. 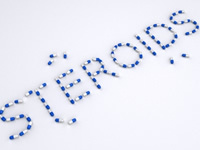 Read more on steroids and their side effects. What are the symptoms of steroid induced diabetes? However, symptoms may not be present unless blood sugar levels are significantly higher than normal. Is steroid induced diabetes permanent? High blood glucose levels whilst taking steroids may subside after you stop taking steroids, however, some people may develop type 2 diabetes which will need to be managed for life. Type 2 diabetes is more likely to develop following longer term usage of steroids, such as usage of oral corticosteroids for longer than 3 months. Am I at risk of developing steroid induced type 2 diabetes? Did steroids bring on my type 2 diabetes? There has been debate as to whether corticosteroids are a cause for diabetes or whether steroids advance the development of existing type 2 diabetes. A study published in 2012, carried out by the University of Sydney, looked to investigate answers to the question. The study, titled Steroid-Induced Diabetes: Is It Just Unmasking of Type 2 Diabetes?, found that those which developed new onset steroid induced diabetes had lower risk profiles than is typical of people with type 2 diabetes. How is steroid induced diabetes treated? The treatment for diabetes you are put on may depend on the extent of insulin resistance and how high your blood glucose levels are. It may be possible to treat your diabetes with diet and physical activity but you may need oral anti-diabetic medication or insulin. If you have been diagnosed with diabetes, you will need to attend health screenings at least once annually so your health can be monitored and treated appropriately.